Book now before your dates are taken!! This gorgeous 2600 sq. ft luxurious vacation house is nestled in the beautiful woodlands of Shanty Creek Resort. 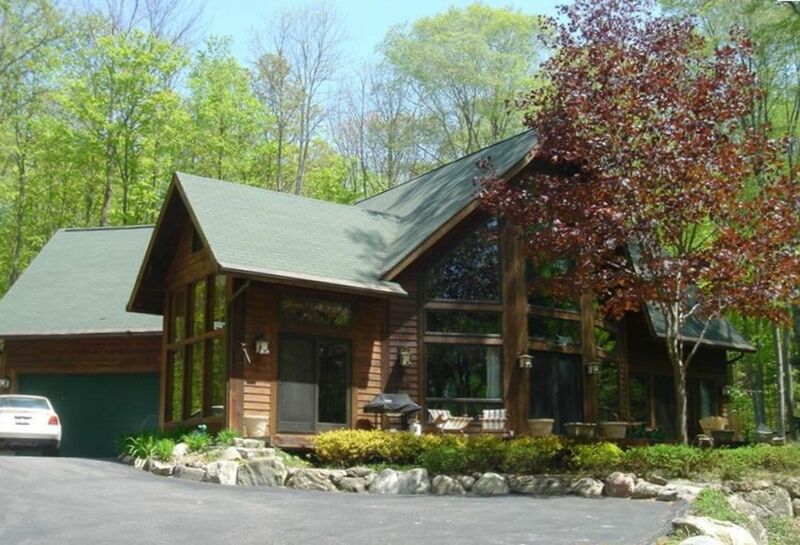 You can spend a week or a long weekend in this 4 bedroom 3 1/2 bath up north get-away. Within two miles you can snowboard, ski, swim, cross-country ski, snowmobile, go tubing, sledding, play tennis and golf, lay by the beach or relax at a pool! The lovely town of Bellaire is a short drive for shopping, or checking out a brew pub and restaurants. You will not get bored here! The home comes with full privileges to the Bellaire Beach Club located on beautiful Lake Bellaire with numerous amenities include; use of club house, playground, basketball, tennis courts, ping pong tables, kitchen, beach, dock, 2 swimming rafts, . It's only a short drive from the house. The house faces south and is filled with an abundance of natural light as you can tell from the photos. The main floor is natural wood and stone. The 4 bedrooms are carpeted. The loft office has wi-fi and a Sprint cell phone rangebooster, and a desk with a great view of the backyard. The master bedroom and master bath open on to the front deck facing a koi pond and waterfall. This makes for pleasant sleeping in a king size log framed bed. It also has a T V and fireplace. The master bath has a jetted tub, a separate dual head tiled shower and dual sinks with granite countertop. The second large bedroom (kids room) on second level has a bunk bed and a separate single bed thus sleeping 3 adults or kids. The room is full of bright colors and has some fun things for the kids! The third bedroom on the second floor has a log framed double bed, dresser and large closet. The second level shares a full bath. Over the garage there is a second master bedroom with a queen log frame bed and full tub/shower. This room has a wall mounted TV. with cable and a DVD player. The living room is a spacious 15’ x 11’ with natural stone dial sided fireplace and cathedral ceiling with a fan and wall mounted TV. The kitchen is 12’x12’ with a Amana stainless steel fridge, gas stove, garbage disposal and oven. It has granite counters and wood floors. The 12’x11’ dining room with an antler chandelier has three windowed walls so nature comes right in for your enjoyment every season. Situated off the entry is the laundry room and a half bath. Being situated on an extensively landscaped acre adds more charm and activities to the home. It is lacking nothing in beauty! Such as a large deck on the sunny side of the home with ample seating overlooking the pond and waterfall. There is also a paver patio in the back for plenty of outdoor living with a table that seats 8 and a large gas grill. Further into the yard are a tire swing, trampoline, fire pit and sandbox to meet the needs of any age group. For more exploring take the trail into the woods. If there is anything that is not covered in this listing please do not hesitate to call and we will try to assist you in getting your questions answered. We purchased this home as a way for our family to have get-togethers while living states apart. We feel family time together is a crucial part of life and a blessing. We hope you and your family can build memories like our family has. We love this property because of the beautiful four seasons and what each one brings. In Spring you can hunt for Moral Mushrooms and watch the fruit trees bloom. In the Summer you can enjoy time at the beach club down the road and golfing. In the Fall you can see the leaves change to orange, red, and yellow, and sit around the campfire making s'mores. Winter brings skiing and family time in the Jacuzzi. You will love staying at our home. It is has a very cozy and warm feeling. The pond and waterfall just outside the door is very tranquil to listen to. The trampoline and tire swing are awesome also. The yard is what we all miss when we think of our home, very private and secluded. High Efficiency front loading washer and dryer. The dining room seats 6 but you can add the 3 additional stools to make room for 8. There is also 4 bar stools at the kitchen counter. The outside patio has a table that can seat 8. A beautiful home and a great place to stay! Our family recently had a three night stay in this home and really enjoyed it. The home was very clean and well equipped with everything we needed. Everyone was impressed with how nice it was and it's in such a great area. Thank you to the owners for sharing your home with us! We are so glad you had a great stay!!! We hope you all come back sometime soon! The home is as nice in person as it looks in the pictures. Very spacious and comfortable for the five adults and three children (3 boys - 15, 12, & 3). Very welcoming conversation-inspiring decor including a massive river-rock fireplace and chimney. The great/family room is the centerpiece with the kitchen and dining rooms nearby. There is a nice “grandparents suite” above the garage and another master suite on the main floor. There are two other bedrooms on the second level. We enjoyed our stay very much and are already talking about returning next year! Thank you for your kind words! We are thrilled you enjoyed your stay and welcome you back anytime!!! We had such a lovely time. The house was more than we expected, the jukebox was such a fun surprise too. And although mother nature was not kind with the cold temperatures, we warmed up with the fireplace. Perfect space for us to relax and quick drive to the slopes. We hope to be back next year! We stayed here for a long weekend with some friends and our children. We all had enough space! We LOVED the jukebox in the living room. We listened to it all night while playing cards after we put the kids down. The kids loved bathing in the Jacuzzi tub and we danced with the kids to music in the living room before bedtime. The kitchen had everything we needed. Everything was clean and the beds were actually comfortable. I have never stayed somewhere that the beds were so comfy but this place exceeded our expectations. We would definitely stay here again!! Thank you so much for the WONDERFUL review! We are so glad you all had a great time! Hope you come back! My family and I stayed here over Easter weekend and had a great time. The home is beautifully decorated and fully furnished. The kitchen has EVERYTHING and more that you would ever need. There was plenty of space and lots to do. There's a closet full of fun games and a great stack of up-to-date dvd's. Our kids loved the tire swing! We would highly recommend this home for your next stay. Thank you so much for your kind review! We are so happy you all had a blast. We hope you come back! Is very well equipped and spacious. We had a wonderful time! Thank you for your kind review! We hope to see you again! Amenities include free access to the Bellaire Beach club on beautiful lake Bellaire, and use of the pool,& hot tubs at Shanty Creek, Schuss Mt. Resort and Cedar River.